All versions are derivatives of Forefront Identity Manager (FIM) and when you do some in-depth research on these tool you’ll definitively see similarities with FIM like the Metaverse and the Management Agents. An interesting overview of all Directory Integration Tools with all available features can be found on https://msdn.microsoft.com/library/azure/dn757582.aspx. These steps will be discussed in more details in the following sections. Preparing for Active Directory Synchronization is all about prerequisites, like the version of Windows, Forest and Domain Function Level (FFL and DFL), object limits, PowerShell and .NET Framework. The complete list of prerequisites and preparation can be found on the following TechNet article: http://technet.microsoft.com/en-us/library/jj151831. One requirement I’d like to point out is the requirement for a proper User Principal Name or UPN. 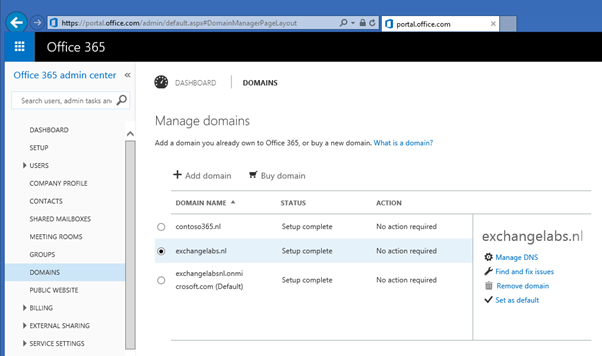 The on-premises UPN suffix must match the Office 365 domain and the domain name must be fully routable to your on-premises environment. If your Active Directory domain is named contoso.local the UPN of your users will be <username>@contoso.local and as such it’s a non-routable domain. If this is the case you have to add a UPN Suffix to your Active Directory. So, if your external (SMTP) domainname is contoso.com and you are using this domain in your Office 365 tenants as well you have to add this to your Active Directory using the Active Directory Domains and Trusts MMC snap-in. Another pitfall related to this is the <username> used in Active Directory. It happens quite often that I’m working with a customer that has a space character in the username, for example “john smith@contoso.local”. In this case not only the UPN Suffix needs to be changed, but the username needs to be changed as well. This is only true for the UPN, the SamAccountName can continue to be used with a space character in it, although I personally think this is not a best practice. Note. 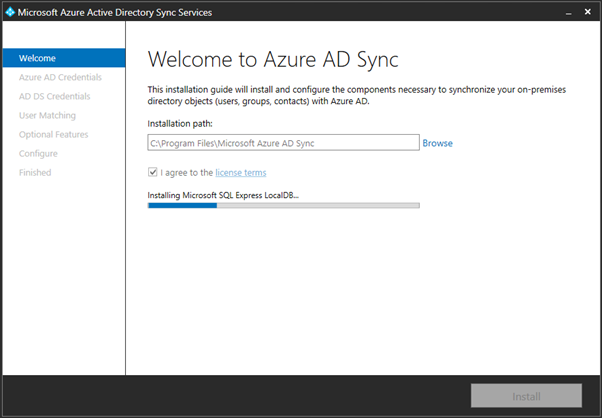 This step is no longer needed as it is now automatically activated by Azure AD Connect. This step is where the Active Directory synchronization is enabled in your tenant. 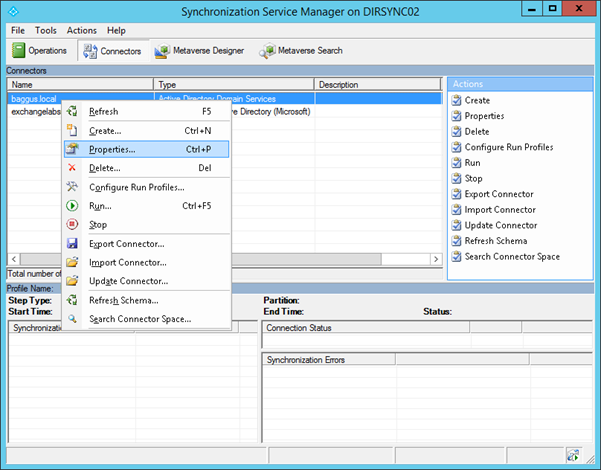 In the third step, Activate Active directory Synchronization click on Activate. 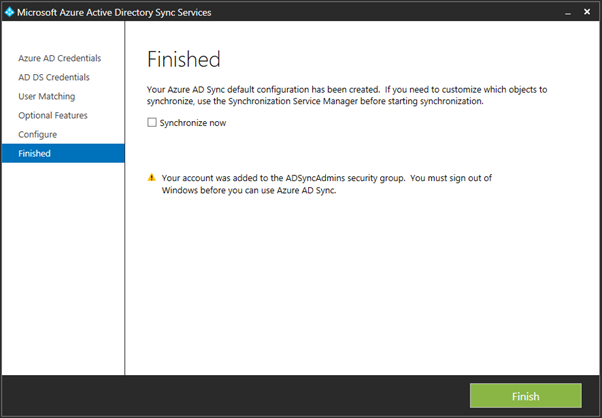 A warning pop-up is shown and if you really want to activate Active Directory synchronization click Activate again. As you can see in the screenshot above there are some issues with the Top Level Domain which is .local in my test environment. After you have fixed these issues, or make sure you only replicate accounts that are properly configured you can continue with the next step. 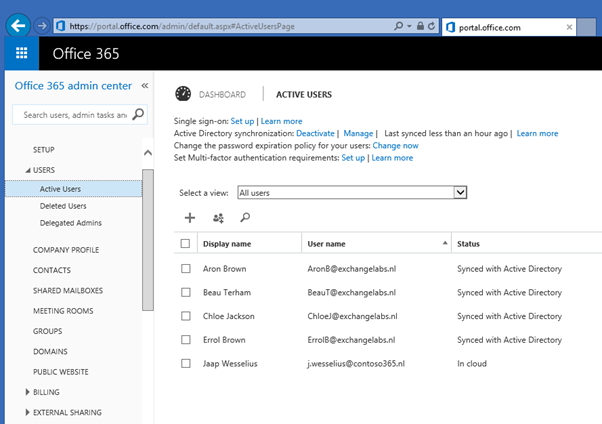 You can also continue without fixing anything, but you shouldn’t be surprised when unexpected issues occur in your Office 365 tenant with respect to user accounts. I’ll get back on these issues in a future blog post. Note. 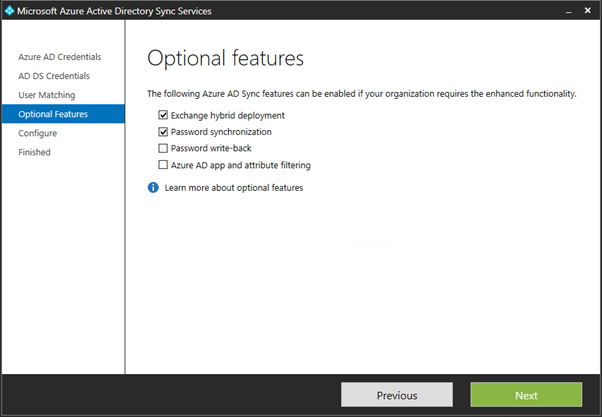 Windows Azure Active Directory Sync Services (what a name) is no longer supported and replaced by Azure AD Connect. There’s overlap between the two, therefore I’ve decided to leave this here. For a more recent blogs on Azure AD Connect on my site you can follow the Azure AD Connect tag here…. Please note that you need to install the .NET Framework 3.5. SP1 and .NET Framework 4.5 (installed by default on Windows 2012 R2) before continuing the installation. If you fail to install this you will see the following error message. Download the tool (MicrosoftAzureADConnectionTool.exe) and start it with elevated privileges. You’ll see an icon appear on the desktop of the DirSync server and after a few seconds the wizard will appear. Select an installation path, check the I agree to the license terms checkbox and click Install to continue. SQL Express will be automatically installed. This is where the metaverse data is stored. At one point you have to enter credentials that are used to connect to Windows Azure Active Directory. This can be the default tenant administrator, but you can also create a dedicated account for this. This account needs to be a member of the Global Administrator, and make sure that the password for this account never expires. 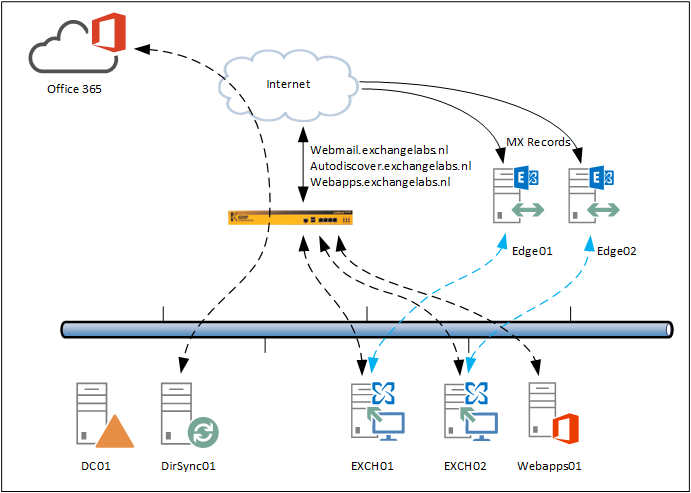 You also need to connect to the on-premises Active Directory. Admin credentials are only needed when installing the tool, these credentials are removed after configuration. 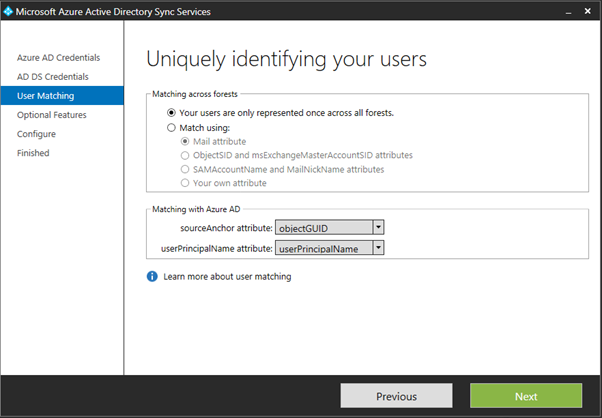 During installation a local user account (on the DirSync server) is created and configured for running the WAADSync service, but a domain user account (MSOL_<random number> is also created. Enter forest name, username and password and click Add Forest. 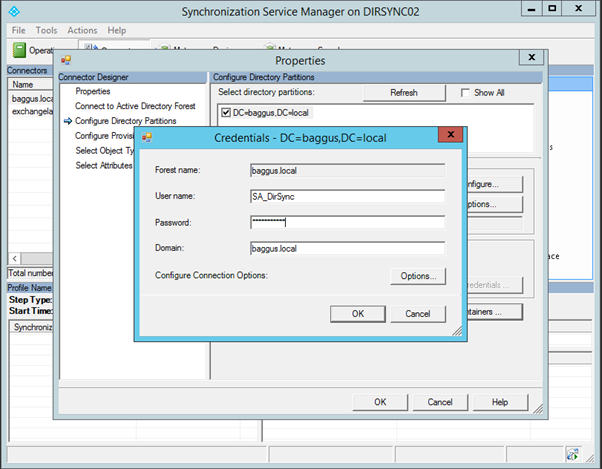 Click Configure to start configuring the Directory Synchronization. Once finished make sure you uncheck the Synchronize now option before you click Finish. At this point you have to logoff and logon again because of group membership changes. These are applied only after logging on…. 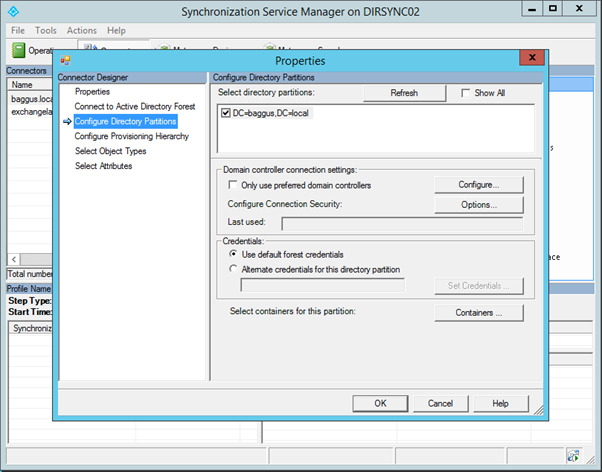 By default the DirSync tool wants to synchronize the entire Active Directory with Azure Active Directory. 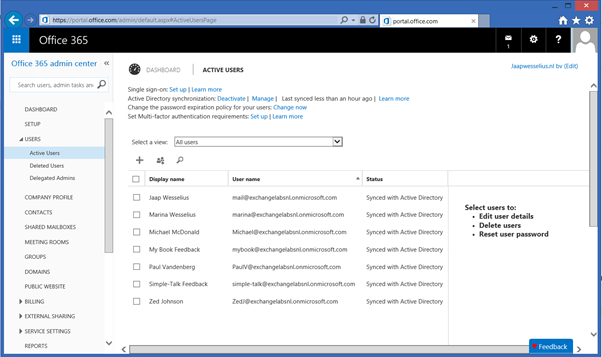 The last thing you want in Azure Active Directory is all your Active Directory service account, accounts for Exchange system mailboxes etc. 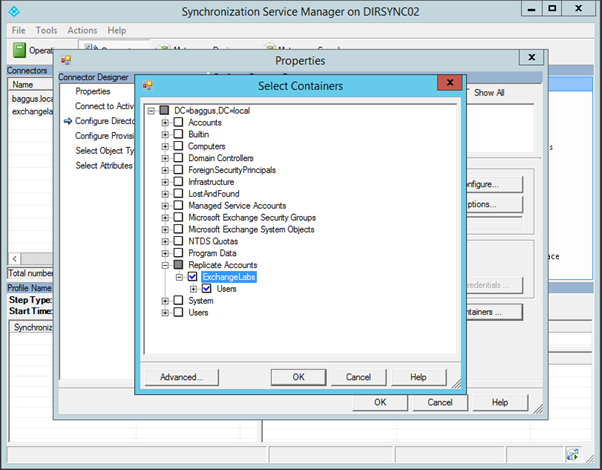 It is possible to synchronize only selected OUs in your on-premises Active Directory. To achieve this you have to start the Synchronization Service Manager which can be found on C:\Program Files\Microsoft Azure AD Sync\UIShell\MIISClient.exe. When started select the tab Connectors. Note. The DirectorySyncClientCmd tool is no longer available. Directory synchronization commands are now available via PowerShell as explained in my blog Force Directory Synchronization. When you logon to the Microsoft Online Portal and select Active Users you’ll see the accounts that are replicated from your local Active Directory. 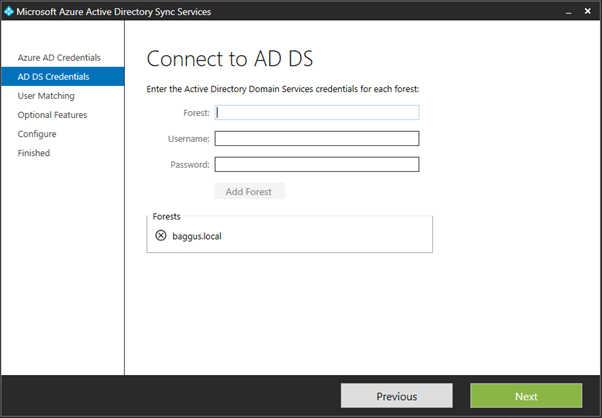 User accounts are replicated to Azure Active Directory, but since AAD does not know how to handle a .local TLD the username is automatically set to the tenant domain name. 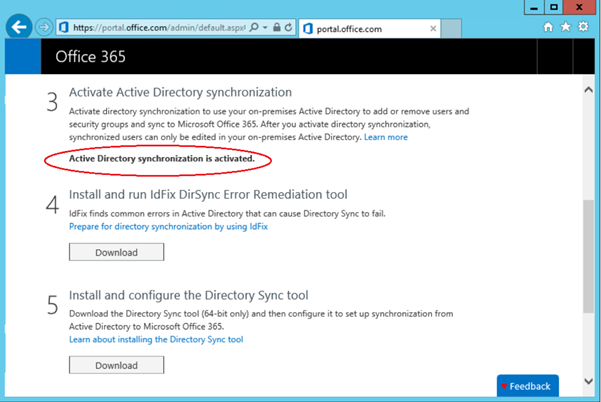 To verify Active Directory synchronization you can check the Microsoft Online Portal as shown in the previous section. The Directory Sync tool also writes entries in the server’s eventlog. 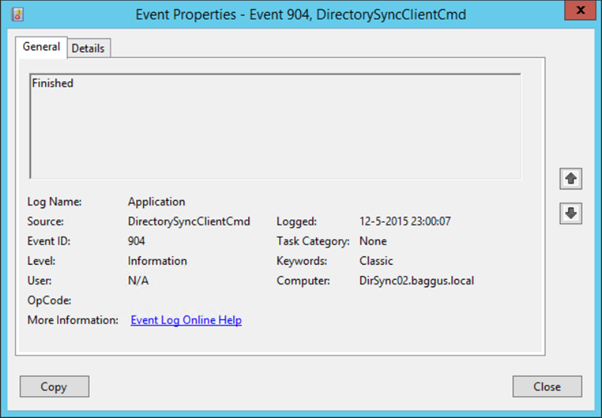 When the sync cycle completes a series of eventID 904 (DirectorySyncClientCmd) is logged in the Application Event Log, each saying Completed, Finished or something like that, depending of the part of the cycle that’s completed. The last part is to activate synchronized users. 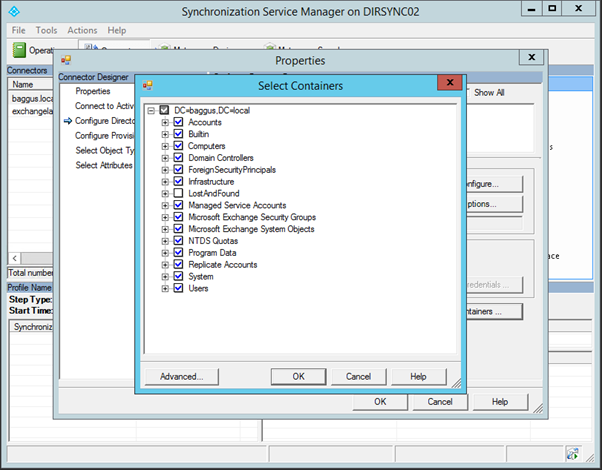 The DirSync tool only takes care about the synchronization of the user account, but it does not assign any licenses so you have to take care of this manually, either through the Microsoft Online Portal or via PowerShell. 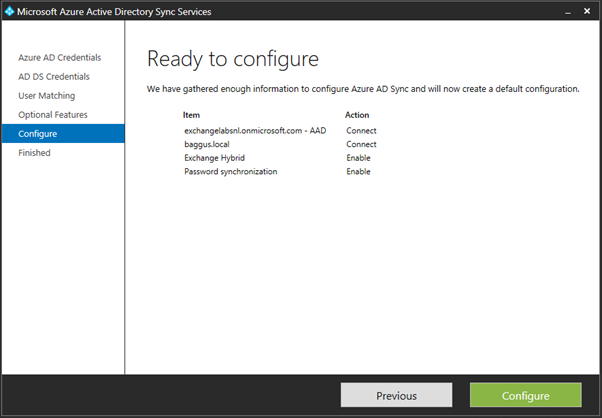 You can use the Azure Active Directory Sync Services tool to setup directory synchronization between your local Active Directory and Office 365. Before you implement directory synchronization you have to make sure you got all prerequisites correctly, especially the UPN Suffix and the username. Installing the tool is relatively easy and simple and once it runs you can keep it running without too much sysadmin interaction, basically a ‘set and forget’ configuration.